Articular cartilage cushions the femur (thighbone) and tibia (shinbone) where they meet in the knee, allowing them to move freely and easily. Chondromalacia patella is a softening or wearing away of the articular cartilage on the undersurface of the patella (kneecap). 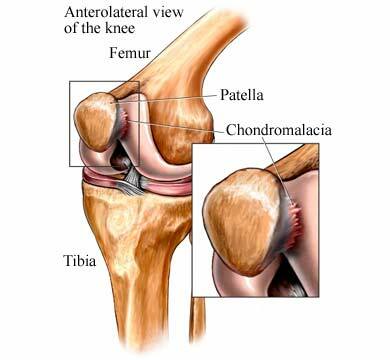 Chondromalacia patella is caused by repetitive motion and misalignment of the kneecap. Compression—Compression bandages can provide gentle pressure to help move fluid out of the area. Elevation—Keeping the affected area elevated can help fluids drain out or prevent fluids from building up. A physical therapist will assess the knee. An exercise program will be created to help recover and to strengthen the muscles in the leg. Maintain a healthy weight to reduce stress on your knees. Properly warm up before exercising or doing any physical activity. Maintain proper strength by exercising the quadriceps, calf muscles, and hamstring muscles. Use proper footwear for your sport. You may need orthotic support to help correct misalignment. Slowly increase activity to avoid stress on the knee. Use proper form and technique for any sport. Harris JD, Siston RA, et al. Autologous chondrocyte implantation: a systematic review. J Bone Joint Surg Am. 2010 Sep 15;92(12):2220-2233. Knee pain. Merck Manual for Health Care Professionals website. Available at: http://www.merckmanuals.com/professional/injuries%5Fpoisoning/sports%5Finjury/knee%5Fpain.html. Updated October 2014. Accessed March 26, 2018. Patellofemoral pain syndrome. EBSCO DynaMed Plus website. Available at: http://www.dynamed.com/topics/dmp~AN~T116002/Patellofemoral-pain-syndrome. Updated February 28, 2017. Accessed March 26, 2018. Patellofemoral pain syndrome (runner's knee). Johns Hopkins Medicine website. Available at: http://www.hopkinsmedicine.org/healthlibrary/conditions/adult/mens%5Fhealth/patellofemoral%5Fpain%5Fsyndrome%5Frunners%5Fknee%5F85,P07841/. Accessed March 26, 2018. Pihlajamäki HK, Kuikka PI, et al. Reliability of clinical findings and magnetic resonance imaging for the diagnosis of chondromalacia patellae. J Bone Joint Surg Am. 2010 Apr;92(4):927-934. Runner's knee (patellofemoral pain). American Academy of Orthopaedic Surgeons website. Available at: https://orthoinfo.aaos.org/en/diseases--conditions/patellofemoral-pain-syndrome/. Updated February 2015. Accessed March 26, 2018. Vasiliadis HS, Wasiak J, et al. Autologous chondrocyte implantation for the treatment of cartilage lesions of the knee: a systematic review of randomized studies. Knee Surg Sports Traumatol Arthrosc. 2010 Dec;18(12):1645-1655.